11 km from Le Cergne city center. Near Abbaye Saint-Fortune de Charlieu, Charlieu. 19 km from Le Cergne city center. Near Centre Hospitalier De Roanne, Roanne. 20 km from Le Cergne city center. In Le Coteau, Le Coteau. 25 km from Le Cergne city center. 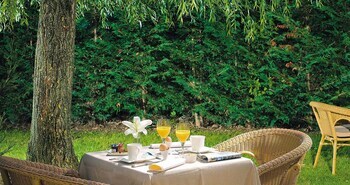 Cityhotels.com offers hotel rooms to fair prices at the most hotels in Le Cergne, France. Are you looking for a comfortable and cheap hotel in Le Cergne we can recommend Relais de l'Abbaye (Charlieu), Hotel Campanile Roanne (Roanne), ibis Roanne (Le Coteau) and Le Saint Cyr (Montmelard). See our liste with 4 hotel recommendations. In total we have 1 hotels in Le Cergne. Can't find what you're looking for here, you can also look at other places close to Le Cergne where we also offer hotel rooms and acommodation. See also our overview of all destinations and popular cities in France.